Crucifix veiled for Passiontide in the Parish Church of St. Martin, Tannheim, Baden Württemberg, Germany. In the liturgical year of some Christian denominations, Passion Sunday is the fifth Sunday of Lent, marking the beginning of the two-week period called Passiontide. In 1969, the Roman Catholic Church removed Passiontide from the liturgical year of the Novus Ordo form of the Mass, but the day remains observed on the fifth Sunday in the Extraordinary Form mass, as well as by the Anglican Communion and by Lutherans. Until 1959, the fifth Sunday of Lent was officially known in the Roman Catholic Church as Passion Sunday. It marked the beginning of a two-week-long period known as Passiontide, which is still observed by some traditionalist Catholics, Western Rite Orthodoxy, various denominations in Protestantism. In 1960, Pope John XXIII's Code of Rubrics changed the name for that Sunday to "First Sunday of the Passion" bringing the name into harmony with the name that Pope Pius XII gave, five years earlier, to the sixth Sunday of Lent, "Second Sunday of the Passion or Palm Sunday". Pope Paul VI's revision in 1969 removed a distinction that existed (although with overlap) between Lent and Passiontide, which began with the fifth Sunday of Lent. The distinction, explicit in the 1960 Code of Rubrics, predates it. He removed from the fifth Sunday of Lent the reference to the Passion. Although Passiontide as a distinct liturgical season was thus abolished, the Roman Rite liturgy continues to bring the Passion of Christ to mind, from Monday of the fifth week of Lent onward, through the choice of hymns, the use on the weekdays of the fifth week of Lent of Preface I of the Passion of the Lord, with Preface II of the Passion of the Lord being used on the first three weekdays of Holy Week, and the authorization of the practice of covering crosses and images from the fifth Sunday of Lent onward, if the Conference of Bishops so decides. Where this practice is followed, crucifixes remain covered until the end of the Good Friday celebration of the Lord's Passion; statues remain covered until the beginning of the Easter Vigil. The entrance antiphon of the Mass on the fifth Sunday of Lent begins with the word "Iudica" (older spelling, "Judica"). This provides another name for that Sunday: "Iudica Sunday" or "Judica Sunday", similar to the name "Laetare Sunday" for the fourth Sunday. Because of the custom of veiling crucifixes and statues in the church before Mass on the fifth Sunday of Lent, this Sunday was called Black Sunday in Germany, where the veils, which elsewhere were generally violet, were of black colour. Passion Sunday is also known as Carlin or Carling Sunday in the northwest of England, when carlin peas are eaten. Those who continue to observe earlier forms of the Roman Rite or of liturgies modelled on it refer to the fifth Sunday of Lent by one or other of its previous names. In those Anglican churches which follow the Sarum Use, crimson vestments and hangings are pressed into service on the fifth Sunday of Lent – replacing the Lenten array (unbleached muslin cloth) – and vestments are crimson until (and including) Holy Saturday. 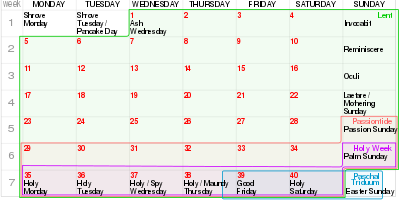 Reflecting the recent shift away from the observance of Passiontide as a distinct season, the Church of England's Common Worship liturgical resources suggest red for Holy Week only (with the exception of the Maundy Thursday Eucharist). The historical readings for the fifth Sunday of Lent in the Lutheran tradition are Genesis 12:1–3, Hebrews 9:11–15, John 8:46–59, and Psalm 43. I Corinthians 1:21–31 and Matthew 26:17–29 are alternate readings. O God, who by the passion of thy blessed Son hast made the instrument of shameful death to be unto us the means of life and peace: Grant us so to glory in the cross of Christ that we may gladly suffer shame and loss; for the sake of the same thy Son our Lord. Amen. The lectionary of the same liturgical text appointed the Old Testament reading as being Gen. 22:1–2, 9–13; the Epistle as being Heb. 9:11–14; the Gospel as being John 11:47–53. In the Roman Rite the name "Passion Sunday" has never been officially applied to the sixth Sunday of Lent in spite of the reading at the Mass of that day of an account in one of the Synoptic Gospels of the Passion of Christ. Until 1969, the account read was always that of the Gospel of Matthew: the whole of chapters 26 and 27 (Matthew 26:1–27:66) until 1954, but reduced in 1955 to Matthew 26:36–27:60 and for priests celebrating a second or a third Mass on that day to Matthew 27:45–52 alone. Since 1970, the revision of the Roman Missal has introduced a three-year cycle in which the accounts of Matthew (26:14–27:66 or 27:11–54), Mark (14:1–15:47 or 15:1–39) and Luke (22:14–23:56 or 23:1–49 are read in successive years. Until 1954, the name of the sixth Sunday of Lent was "Palm Sunday". In 1955, the name became, for 15 years only, "Second Sunday of the Passion or Palm Sunday". In 1970, it became "Palm Sunday of the Passion of the Lord". The sixth Sunday of Lent has thus never officially been given the exact name "Passion Sunday" and the term "Palm Sunday" is given first place in its present official name. ^ The Code of Rubrics speaks of Lent (tempus quadragesimale) as comprising Passiontide (tempus Passionis), but at the same time distinguishes Lent in a narrower sense (tempus Quadragesimae) from Passiontide. ^ The distinction is found repeatedly in, for instance, the pre-1960 Ritus servandus in celebratione Missae, which speaks of Passiontide as following Lent (without suggesting that Lenten observances should end at that point), but which also speaks of Lent as extending at least to Wednesday of Holy Week, as in: "In Quadragesima autem a Feria IV Cinerum usque ad Feriam IV Majoris Hebdomadae ..." (Ritus servandus in celebratione Missae, XI, 2). ^ Mershman, Francis. "Passion Sunday." The Catholic Encyclopedia Vol. 11. New York: Robert Appleton Company, 1911. 6 April 2019 This article incorporates text from this source, which is in the public domain. ^ Yonge, Charlotte M., ed. (1879). The Monthly Packet of Evening Readings for Members of the English Church. J. and C. Mozley. p. 514. ^ Heritage Vegetables, Sue Stickland. London: Gaia Books. p 149 (1998). ^ a b c The Book of Worship for Church and Home: With Orders of Worship, Services for the Administration of the Sacraments and Other Aids to Worship According to the Usages of the Methodist Church. Methodist Publishing House. 1964. pp. 62, 98. Retrieved 25 March 2017. This page was last edited on 15 April 2019, at 17:07 (UTC).